NEW ORLEANS — When Donavan Brazier, Edward Cheserek or Jarrion Lawson is handed their gender’s version of The Bowerman Award on December 16 at the Orlando Grande Lakes Resort, it will truly be a special moment. First of all, months of hard work will pay off — just as it would have for Courtney Okolo, Keturah Orji or Raven Saunders earlier in the night — when one of them is named their gender’s most oustanding collegiate track & field athlete. All six finalists were nothing short of spectacular during the past track & field cycle. Collegiate competiton, long-standing records and history were no match for them indoors or outdoors. Brazier shattered Jim Ryun’s 50-year-old collegiate record in the 800. Cheserek became the first man since Galen Rupp in 2009 to sweep the distance slate clean when he won the 3000, 5000 and anchored the winning DMR team indoors and nabbed the 5000 and 10000 titles outdoors. Lawson, who won the men’s fan vote, is now mentioned in the same sentence as joining Jesse Owens as the only men to win the 100, 200 and long jump titles at the same NCAA Division I Outdoor Track & Field Championships. Okolo went undefeated against collegians in the 400, lowered her own collegiate record and was the first collegiate woman to ever go sub-50 seconds in the event. Orji, who won the women’s fan vote, took aim at two record books outdoors. She broke the collegiate record in the triple jump at the NCAA East Prelims and then toppled the American record at Historic Hayward Field. Saunders broke both the indoor and outdoor collegiate records in the shot put. The second of which stood for 33 years. What’s so special about Brazier, Cheserek or Lawson holding The Bowerman Award? Well, one of them will be the 16th overall winner of collegiate track & field’s version of The Heisman Trophy on December 16, 2016. 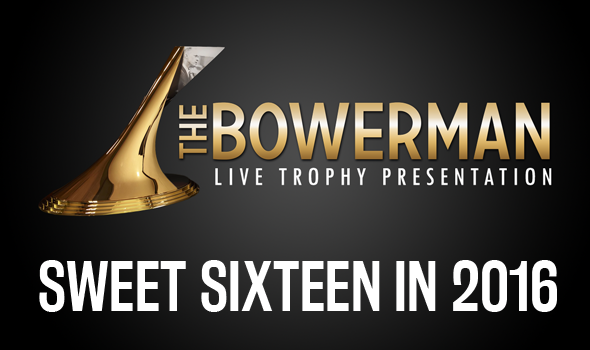 And if you look at the calendar, we have 16 days left until The Bowerman Award Ceremony will be aired LIVE, free of charge on FloTrack.org.